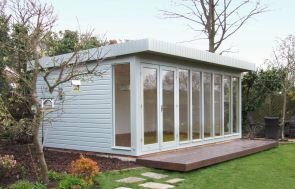 This large, multi-roomed Salthouse Studio, has been installed in our customer’s garden in Bromley, Kent to use as an office, as well having a toilet and a storage area, creating a highly functional garden building. 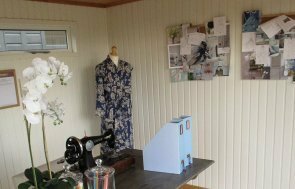 Altogether, this Studio is 4.8 x 4.2m in size; A large office area at 3.3 x 4.2m, a storage area at 1.5 x 2.4m, and a toilet at 1.5 x 1.8m, creating three very separate rooms. The exterior has been constructed using Scandinavian Redwood, painted in our Valtti Paint System, Pebble, whilst the pent roof is finished in heavy duty felt and there is also black guttering on the outside. The office area and the toilet are both fully insulated with painted matchboard lining on the walls, and there is also a natural lacquer on the floor. Also inside the office is an electrical pack with a heater. This building is very practical, however, while we can provide the space for the toilet, we don’t actually install the toilet facilities. Want a Garden Studio like this one? 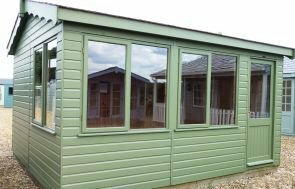 You can always revisit our complete range of Garden Buildings here. We also welcome visitors to each of our Seven UK Show Centres where we showcase a variety of buildings, in various specifications, for you to experience the luxury first hand. If you have an idea for a tailor made building, please request a callback, contact us or call us on 01760 444229 and a member of our friendly team will discuss your requirements with you.